Jenny stared at herself in the mirror. Her breakup with Chase had hit a lot harder than she anticipated. She gazed into her own hollow, dead eyes. “What is wrong with you?” she asked her reflection. “Why can’t you ever hold on to anyone? Why can’t you ever just be happy?” Jenny looked down at the counter. The pills were out of the container and in her hand before she realized what she was doing. She stared down at the seemingly harmless handful of little white pills she held in her palm. It would be so easy to just take the whole lot of them, and be done with the world. It wouldn’t be hard- just one quick swallow and it would all be over. She began to cry, ferocious tears streaming down her face. Her knees gave out, and she fell to the floor, still clutching the pills in her hand. She wrapped her arms around herself, as if to keep herself from completely shattering right there on the bathroom floor. Never in her life, had Jenny felt as broken as she did there- in that instant. She didn’t want to die, but she didn’t want to feel this way anymore either. She ran through every broken relationship she had experienced in her life, and found all her faults in each of them. She thought about all the horrible things that have happened in her life- that keep happening. She thought of all the things she did wrong and how this was all her fault. It was her fault she felt this way- she had let this happen. Jenny sat on the floor and sobbed for what seem like hours, all the while clenching the pills in her hand, so disappointed in herself that she had come to this. Disappointed that she had let the sadness take over her mind like this. Disappointed that she had let herself become to broken inside. Jenny heard a noise outside the door and froze. A soft knock erupted from the other side of the door. Jenny’s eyes immediately went to the lock, which, thankfully, she had turned. “Jenny?” a soft voice asked. It was Jilly. Small, innocent Jilly. She was so unexposed to the pain of the world, still nestled in her cocoon of safety and ignorance. Jenny wanted Jilly to stay that way for as long as she could. She couldn’t stand to think of her little sister’s life completely shattering because of her and her weaknesses. Jenny stood up, wiped the tears from her face, and opened her hand into the trash, letting every last pill fall into the bin. Then she opened the door to her sister’s blissfully ignorant face, and forced herself to smile down at her. The war inside her may not have been over, but she allowed herself to revel in the fact that she had won this battle. I dream of happiness. I am young again surrounded by warmth in a meadow with trees and flowers all around it. I dance and skip in my happy little spot. As she says this, her face begins to twist. She lets out a terrifying scream. I close my eyes, and when I open them He is standing there. I turn and begin to run. He does not follow. I look back to see Him with a smile. It is not the twisted smile I have grown to expect. It is the smile I fell in love with. That sweet crooked one He flashed me the first day we met. The one He had on His face when He asked me to marry Him. The one that was always on His face before the alcohol. I turn around and walk back to Him. He still smiles at me. My brain tells my legs to turn around and run, but they don’t listen. My heart is locked on Him. The scene describes a dream one of the protagonist has one of the first evenings described in the book. It takes place after she is beaten, once again, by her drunken husband for not responding to his “call” fast enough. Writing her dream scenes has been my favorite thing to write in this book so far. Being a perfectionist is never easy. When things don’t end up perfectly, it’s hard not to feel like a complete failure. Most people would love to get a 95% on a test, however a perfectionist sees this equaling an F. Anything below 100% just won’t do. So many things happen in your brain, and so many things bother you and you don’t understand why. Neither does anyone else, which makes it hard to relate to people sometimes. The best part is when you’re angry for not doing something perfectly, and then you get mad that you think it has to be perfect, but you’re still mad that it wasn’t perfect, and AHHHHH! The cycle just goes on and on and on. 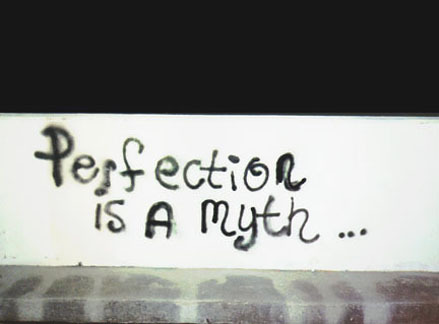 Of course, we all know nobody is perfect, but that doesn’t seem to stop the pursuit to perfection. In my brain, if it isn’t perfect, I have failed. Many times, when people get a B on a paper, they are satisfied with that. Me? I see the paper and complete and utter crap. This mindset forces me to constantly ask myself, “Why am I never good enough?” because of course it’s always me, and never anyone else. My friends and I had a fight? Yep that was my fault. I broke up with my significant other? That’s all on me. The teacher took off points on my paper? Well clearly it was the worst paper ever written, and I should just stop trying because I’m a horrible writer. So where does this come from? Why am I forever trying to be perfect? According to a recent therapy session, it has come to my attention that maybe it stems from my fear of abandonment. In my brain- if I don’t do something perfectly, it’s a failure. If it’s a failure then I’m a failure. If I’m a failure, then I’m not good enough. When I’m not good enough, people leave. And when people leave, I feel alone. So to avoid feeling alone, I try my hardest to make everything perfect. But are my friends really going to leave if I don’t get an A in my Gender Issues class? Probably not, but part of my brain seems to think that that is true. As frustrating as perfectionism is, it probably is coming from some other underlying issue that you are using perfection to avoid. If you sit and think hard enough, you can find it. And when you do, the perfectionism is that much easier to deal with and maybe even let go of. Lately in my pursuit for a healthy brain, I have noticed noise. Often times the noise seems to be too much. There is so much noise that surrounds us every day, but why is it only too much some of the times? Sometimes the loudness of a party is something I crave and love. I love the shouting and the amount of people and the overall loudness of it all. But other times, even the simplest of noises is too much. Someone is talking or playing a video, and seems too loud for my brain to function. Many times I can read books despite the noises around me, other times I can’t even get through a sentence with the T.V. on. I feel so overwhelmed with all the noise around me that I can’t even hear myself think. So what can you do when the noise is too much? What do you do when you want to scream out “SHUT UP!! !” The simple solution is to simply move somewhere quiet, however that is not always possible. My advice is this: take a deep breath and relish in the quiet moments. When the noise starts again, just close your eyes and breathe. Do your best to focus all of your energy on something until the noise isn’t so troubling anymore. Noise is all around us, so rather than running to find a quiet place to run when the noise is too much, learn to live your life hand in hand with the noise that surrounds you. Because a world filled with noise is better than a silent one.